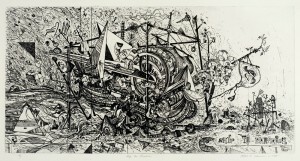 Robert S. Neuman’s Ship to Paradise at Bates College Museum of Art, Lewiston, Maine. Friday, January 18, 6-8pm., Lecture by author and art historian Carl Little, Olin room 104, 6pm, followed by a Opening Reception for the Artist in the Museum of Art. 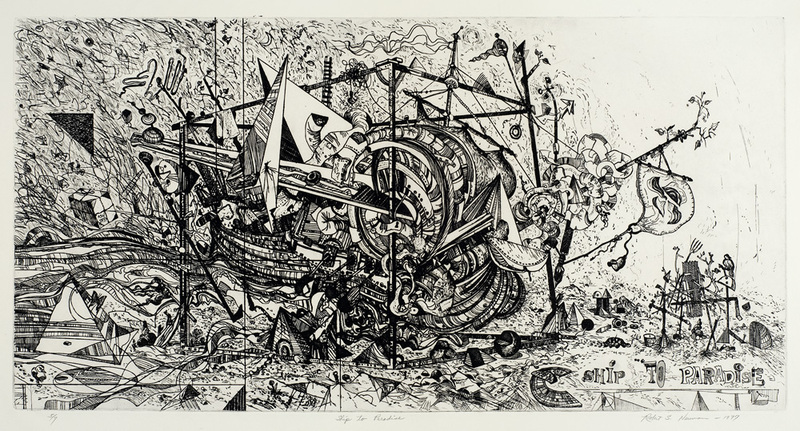 Robert S. Neuman’s Ship to Paradise is the artist’s personal exploration of a theme that dates back to the Middle Ages – the folly and foibles of man. Informed by his reflections on the modern day world around him and imbued with a knowledge of seafaring and shipbuilding intrinsic to life in Maine, Neuman’s intricate compositions recall the fantastical paintings of the Dutch artist Hieronymus Bosch (c. 1450-1516). Images of the ship in various stages of its journey, from construction to calamity to repair, function both as a cautionary tale on the dangers of the quest at hand and as a metaphor for the human condition. Neuman began exploring the theme in 1977 in whimsical sketches, prints and mixed-media works. In 1983, August Heckscher, who was a fellow summer resident of Mt. Desert Island and who operated a fine printing press there, commissioned Neuman to execute a portfolio of prints to accompany a fine facsimile edition of the medieval humanist Sebastian Brandt’s Shyp of Fooles. Brandt’s text, which dates to 1494, is an allegory outlining in 112 chapters the vices and worldly conceits of man that prevent him from reaching godly salvation in paradise. Translated from German into Latin and then into French, English, Dutch, and Low German, the tale became a best seller, with woodcut illustrations by Brandt’s contemporary Albrecht Dürer that clearly conveyed Brandt’s message to the literate and illiterate alike. Like Brandt’s wayward passengers, Neuman’s ship is ill-equipped for its journey. As described by the printer’s son, Philip Heckscher, the “ship is not ship-shape. Its rigging is a-fly, its hull heavily patched, its deck encumbered with what the artist calls ‘worldly clutter’ . . . Even an amateur sailor can see that this ship isn’t going anywhere.” There is no captain guiding it through the misfortunes it faces – whether airborne, encumbered by the great rock, or on fire – and in most of the images, the passengers are nowhere to be seen. For Neuman, as for Brandt, the journey is ultimately a metaphor for the human experience. This exhibition is produced in collaboration with the Heckscher Museum, in Huntington, NY and the Sunne Savage Gallery, in Boston, Massachusetts and has received support from Astoria Federal Savings and the Clare Chester Stone Marital Trust. An illustrated catalogue with essays by Philip Heckscher, Carl Little, and John C. Olin accompanies the exhibition.